The statistics of prostate cancer show that it is a major killer of men and that ‘a man dies of Prostate Cancer every hour in the UK.’ This event was designed to raise awareness of the often-undetected disease and to offer men aged between 45 and 75 the opportunity to take a free blood test. The test which is not perfect is still the best method available at present to detect the early stages of the cancer which does not generally have any symptoms in its early stages. ALTON LIONS organised, manned and raised funds for the event, including a highly successful quiz, and with the funds donated by Cllr Hill. The tests were carried out by the Prostate Cancer Support Organisation (PCaSO) (www.pcaso.org) who provided the Phlebotomists to take blood samples and organised for the samples to be tested at an NHS hospital laboratory. 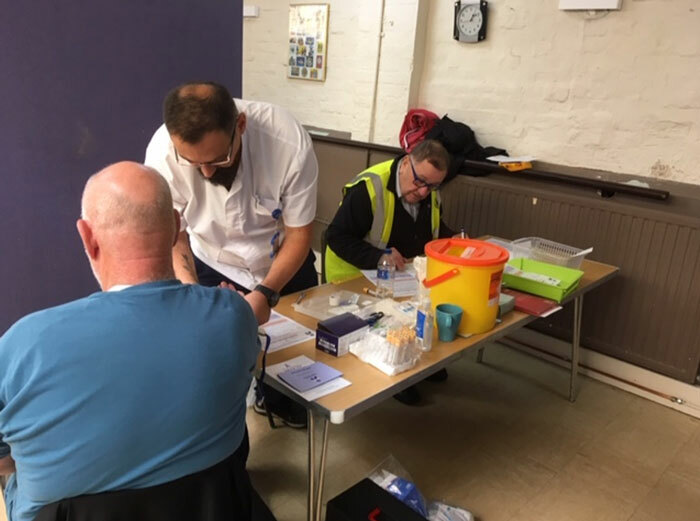 John Bennigsen, ALTON LIONS project leader for the event commented that the final results will be sent to PCaSO who will then post them back to the patient, with an explanatory letter authorised by a retired consultant urologist. Adding that he was pleased to be able to support what was, “a very well organised and well attended ALTON LIONS Prostate Testing Day,” with a donation of £1,000 from his East Hampshire District Councillor Grant Fund.